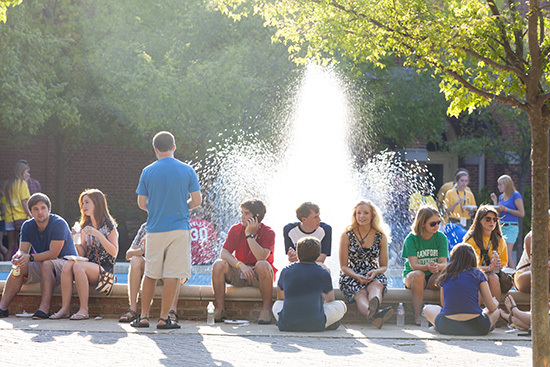 While the plaza isn’t the geographic center of campus, “Ben Brown,” as it is casually called by everyone in the Samford community, is still the main gathering place for the university’s students. This most likely is due the plaza’s proximity to many of the campus’s essential facilities—including the dining hall, food court, University Center, Davis Library and the “Quad”—and the fact that a large portion of Samford students coming from Smith, Vail, and Pittman Halls, West Village and West Campus have to pass through or near Ben Brown on their way to class. On any given day in the fall and spring, it isn’t uncommon to see a hundred or so students milling about the plaza, sitting by the large water fountain, talking to one another or enjoying lunch on one of the benches. As popular as Ben Brown Plaza is, most students probably don’t stop to think about the name. The plaza is named for the late Ben B. Brown, a World War II veteran, former Birmingham community leader, and member of the Samford University Board of Trustees. Brown served as board chairman for 13 years, from 1973 to 1985 and led the presidential transition from Leslie S. Wright to Thomas E. Corts in 1983. His late wife, Frances, was active with the Samford Auxiliary, and one of their sons attended Samford. In addition to his association with Samford, Brown was also president of the Birmingham Chamber of Commerce, the Birmingham Rotary Club, and the Alabama Symphony board. Professionally, he was vice president of South Central Bell Telephone. Mr. Brown died in 2001 at the age of 83. Ben Brown Plaza was named for him following its construction in 1984 to honor his many contributions to the university. A plaque near Dwight Beeson Hall recognizes the naming of the plaza. Editor's note: This is one in a recurring series on "hidden gems" on the Samford University campus.